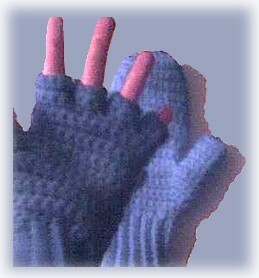 Free crochet pattern to make fingerless gloves with mitten tops for women or teens. These mittens convert to fingerless gloves by pulling back the mitten top. A strip of velcro (which can be cut) or the hook & loop dots of velcro that look like buttons. Gauge: 3.5 sts per inch. 4 rows per inch. ROW 1: 1 sc in 2nd ch from hook, 1 sc in next 13 chs, ch 1, turn. (12 sc) Next rows are through back loops only. ROW 26: This is the joining row. Fold cuff so Row 1 is behind Row 25, ss to join Row 26 to Row 1. Turn cuff inside out. This will be the right side. RND 3: 1 sc in next 12 sc, 2 sc in next 2 sc, 1 sc in next 12 sc, ss to join, ch 1, turn. 1 sc in next 25 sc. Beginning at the last sc you just made, count back 12 sc, ss to join your last sc to this sc, ch 1, turn. RNDS 2 to 7: Same as RND 1. Cut yarn leaving end approx. 8″ long. Using darning needle thread yarn through the 7 sc and pull tight, fasten off. the thumb. In the first sc by base of thumb pull up a loop and ch 1 and 1 sc. You join to the sc on the row where you made the thumb. Look back under “Thumb” and see where you made the “1 sc in next 25 sc”. Then you counted back 12 and joined to make the thumb opening. This left 13 sc worked on that row before the thumb opening, but the next 13 sc after the thumb opening was not worked. What you are doing when you start the palm, is working those previously unworked 13 sc and joining to the first sc of the “25 sc” that you made when beginning the thumb. RNDS 4 to 6: Same as RND 3. 1 sc in next 17 sc, ch 2, beginning at the last sc you just made, count back 8 sc, ss to join to that sc, ch 1, turn. On the back of mitten, find the RND that is midway between the thumb and the base of fingers. (I used the third RND up from the thumb). Begin at the thumb end with finger ends toward you. On that rnd you can see the top loops fo the scs. Attach yarn and through those loops place 13 sc evenly across the back of mitten. To begin after attaching yarn, pull up a loop and make 1 ch and 1 sc. Then make 12 more sc across the back of mitten. Next: ch 15, ss to join to the first sc, ch 1, turn. RNDS 3 to 9: Same as RND 2. RND 17: 2 sc tog 5 times, ss to join, fasten off. With darning needle, weave in all ends. Work exactly as for the Right Mitten up until you complete the fingers. Now turn the mitten over, it will also fit the left hand. What was the palm side for the Right Mitten will now be the back side for the Left Mitten. With that in mind, work mitten top the same as for the Right Mitten by beginning on the back of mitten, except this time with the finger ends towards you, you will begin at the little finger end, instead of the thumb end. Contributed by Sue’s Crochet and Knitting site, which offers Free Crochet and Knit Patterns, a Craft Discussion Board, Craft Supplies and much more.